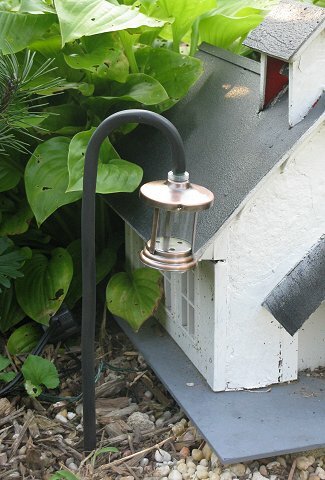 They are all designed with bases, so you have to fasten them down to something instead of just poking them in the ground like you do, say landscape lights. Yes, they are charming and effective as far as they go. But the solar lamps are still too big and don't stay on long enough when the days get short. 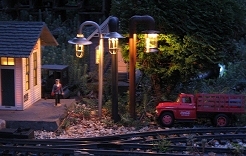 And the Lionel-style lamps have to be fastened to something, plus they're a bit small for some of my settings. (And they yellow, which can be tempered with some Indoor-Outdoor UV-resistant spray). 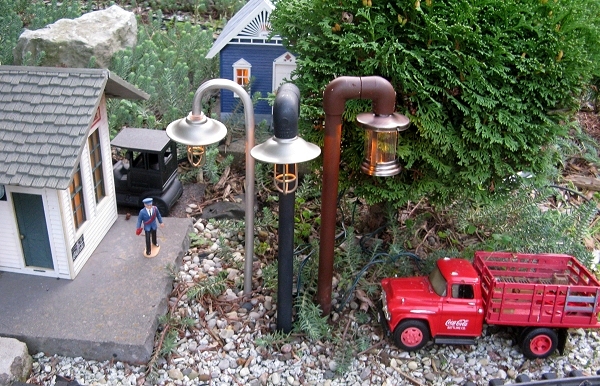 In April, 2009, a trip to Wal-Mart's seasonal "lawn and garden" display snagged me two different lamp sets, one of which I'd never seen before. I haven't been that tempted by the little lantern-style light strands, but I could think of several uses for the utility-style strands. These sets were made to go outside, at least temporarily. 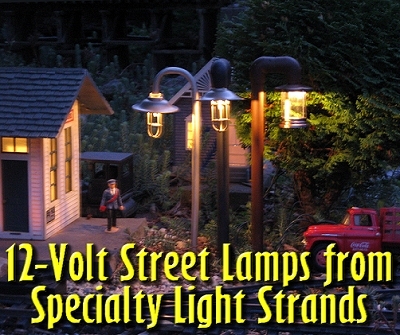 Because they came ten "lamps" to a 120-volt strand, each "lamp" would handle 12 volts, the same voltage produced by my low-voltage garden lighting sets. 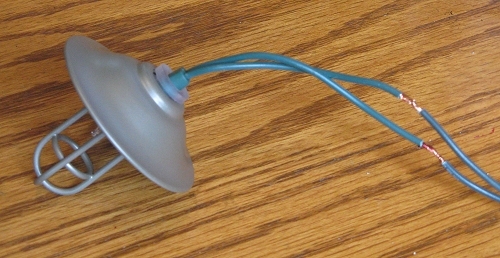 As a "sanity check," I separated one of the utility lights from its strand, soldered on longer leads, and lit it temporarily by a 12-volt "wall wart" that I rescued from some defunct rechargeable tool. 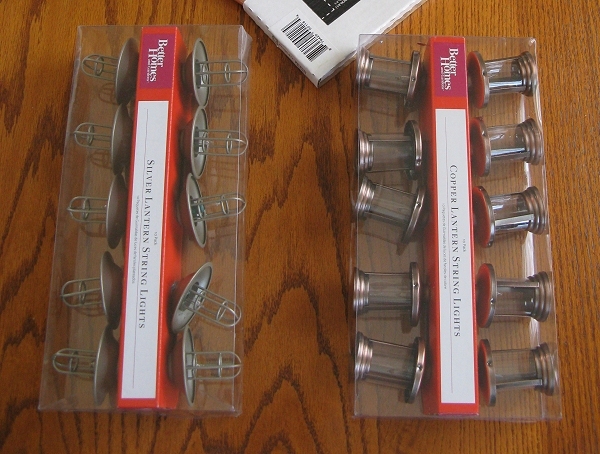 By the way, each package was $10, with ten lamps to a package. So the cost of each lamp would be only $1 plus the cost of whatever other materials I needed to buy to make my project work, a pretty good deal compared to buying ready-made lamps. In the middle of a ridiculously busy summer, l did squeeze in a few attempts to find a good method for making the "candy canes." These largely involved trips to various hardware stores trying to find something that "registered." On two different trips to two different "big box" chain stores, the obvious new hires working the plumbing aisles told me "we've never had anything like that;" in both cases, I found what I was looking for later in the same store, when I went in for something else. You gotta love'em! 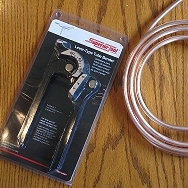 I liked the idea of using copper tubing, so I bought a roll of 3/8"OD tubing. 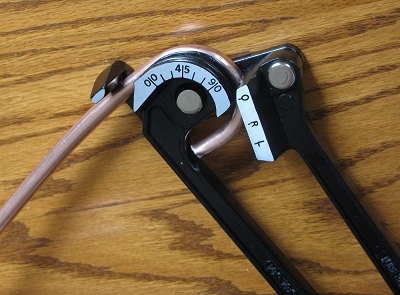 I also spent about $11 on a set of "tube bending" springs that are supposed to keep brass tubing from getting crushed while you bent it by hand. Sadly, the results were not impressive. It's hard to get tight, even curves, much less cosmetically impressive ones. The resulting bend could have been used for plumbing that was hidden in the wall, but it was way too ugly to use for anything people would see. They might work better with smaller diameters of tubing, and they would almost certainly work better with aluminum tubing, if you have access to that. 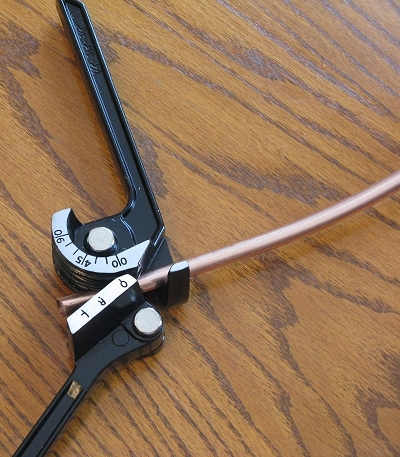 I then investigated several styles of "Lever" Tube Benders." These cost from $26 to $50, which would seriously kick up the price tag for my project. But I finally figured it was worth taking a chance - after all I could always pretend that the tool would come in useful for something else some day. I found a "Superior Tools" bender at Lowes for $26.43. It was in a dust-filmed "blister pack" in a dusty bin of obscure "plumbing tools" that looked like they hadn't been disturbed for months, if not years. I guess PVC has rendered them such tools obsolete. No wonder the sales drone didn't know where they were. So for a club or a very large layout, the cost of the tube bender would eventually be recouped. But if I was only doing ten lanterns this way, the result would be $5.30 a lamp - still a savings over buying pre-fabricated lamps, but not necessarily a no-brainer. So I bought enough PVC elbows to make four lamps. Note: I didn't count the cost of wiring into either solution, because I have a bunch I salvaged from non-working Christmas light strands last fall and winter. If you have to buy a roll of, say, 18-gauge lamp cord to complete this project, add that to the total cost. Also, I didn't add in the cost of my solder and soldering iron, which you also may need to purchase. This section assumes a low-wattage (30-40-watt) iron, the kind I "grew up" using on electronic circuits and small models. It also assumes 60/40 rosin-core solder , the kind that is most often used for hobby and electronics projects. I don't count the cost of the solder into the cost of the project, because, unless you are an electronics engineer, the first package you buy may last you the rest of your life. Cut the Long Wires - Since I was experimenting and didn't know how long I would need the wires to reach between the lamp posts and the garden lighting wires, I cut each "long wire" about 3' long. If you know you're going to be wiring them closer than that, remember to compensate for the 14"-16" length of the candy cane, plus how far the end will be shoved into the ground. Unless you're paying a premium for wiring, you're better off going long than too short. Prepare Your Low-Voltage Soldering Iron Your soldering iron not only has to be hot - it also has to be able to transfer heat. If your soldering iron has been used a few times, consider using a fine sandpaper or sanding block to sand the tip clean before your next soldering attempt. Some folks also use a trick called "tinning," which involves melting a little solder on the tip of the iron before you start. If you're using a low-voltage soldering iron, plug it in at least ten minutes before you plan to start using it (I usually go twenty). Put it where you won't accidentally bump it or the cord, but where you can keep an eye on it. If it starts smelling hot, that's good. Once your soldering iron has been plugged in for more than a minute, be certain to grasp it only by the handle, and never try to pick it up while you're looking the other way or holding something awkwardly in your other hand. Strip the Wires - Using a pair of sharp scissors or a knife, put a notch in the insullation about a half-inch from the end of the wire. Until you get a "feel" for this, you might want to go gently, maybe putting two light notches on opposite sides. You're trying to make the insulation weak enough to pull apart at that point when you put pressure on it, not necessarily to cut all the way through all the way around, which would be very time consuming. You can buy special tools for this, by the way - I just got used to stripping wires in the "field" with whatever was handy. When you have a good notch, pull the end of the insulation off. If that doesn't work, you can either make the notch a little deeper or get the "v" part of the scissor blades in the notch and pull the insulation off that way. Folks who've been doing this a while can use household scissors to notch and remove the insulation in something approaching one smooth motion. Look at the base of the cut, now. If it looks like half the wires got cut off at the notch, you were too ambitious with your notch. Try again. If most or all of the wires go to the end of the strand, congratulations. The photo to the right above shows a lamp with one wire notched and the other stripped. Don't worry if the wires are different lengths once they're stripped; for this project it doesn't matter at all. In fact, it's better if they're "staggered," so the joints aren't next to each other in the lamp post tube. 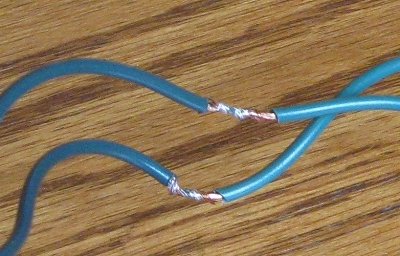 Twist the Wire Ends Together - When you have all four wire ends for one connection stripped, wrap two facing ends around each other. The more turns you have in the wire strands, the better the mechanical and electrical connection you'll have when you're through soldering. Solder the Wires - Spool out a few inches of the solder without breaking it off. Rosin core solder is hollow in the center; it contains a chemical "flux" that helps the wires heat evenly as the solder is flowing over them. Ordinarily when you use the solder, the end of the solder melts "shut," keeping the rosin from running out. If you break off a piece, you could lose your rosin before you use the solder. 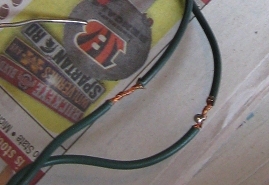 Proper soldering requires heat transfer to the wires being soldered as well as to the solder itself. By now your soldering iron should be plenty hot to do the job. It will usually smell hot, and it will leave a brown spot on a piece of newspaper in less than a second. Still, the heat transfer doesn't happen automatically. Press the soldering iron against the wires to be soldered. Then with your other hand, manipulate the solder strand so that the end of it meets the place where the soldering iron tip meets the wire. Note: In the photo above, you can see that I used several layers of newspaper to avoid burning my work surface, another bad habit I got into soldering "in the field" years ago. You should work on a tile or concrete surface, although a wooden workbench is usually safe. If you are using a high-wattage iron you must work on tile, stone, concrete, or the like. The Magic Happens - At some point after you're held things in the position above for a minute or so, the end of the solder strand will disappear. 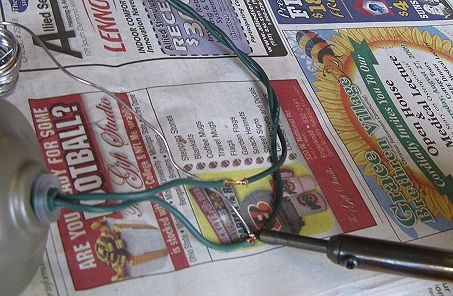 If the "magic" happens correctly, a blob of melted solder and hot rosin will hit the tangle of wires at the same time. 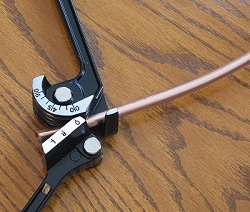 The rosin flux will transfer the soldering iron's heat to the wires in less than a second, and the wire strands will draw the hot solder into the spaces between them the way a wick draws hot wax. I always leave the soldering iron on the joint for an extra second or two to make certain the solder has "wicked" as much as it is going to. Don't Leave any Cold Solder Joints - Occasionally, though, the melted solder will simply hit the edge of the wire and cool there in a blob. This is one kind of "cold solder joint" and is the nemesis of electrical engineers and recording technicians everywhere, because even professionals who know better sometimes leave them that way. After all, they usually work for a while. Another way to spot a cold solder joint is if the solder still isn't shiny when it cools. A proper soldering job is always shiny when it is done. Can you just re-melt the solder? In some cases, there's enough flux left to do the job, and when you reheat the wires and melt the glob, it does what it's supposed to the second time. If that happens, be especially careful to make certain that the "wicking" action has occurred and the final joint is shiny. If the second attempt doesn't product a shiny joint, I am likely to knock off the solder and start from scratch, though. Tape or Shrinkwrap the Joint - If you've used shrinkwrap in the past, you know what to do - slide a piece up over the joint and heat it until it shrinks and seals the joint. I taped over the joint with vinyl electrical tape. If you do this, tape at a 45% angle, not straight across; that will make tape less likely to get knocked loose and slide down, exposing the joint. 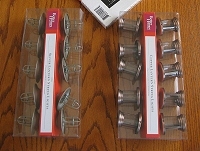 Now it's time to either bend or assemble the "candy canes" that will support your lamp fixtures. As I mentioned before, I had a number of false starts with this before I figured it out. 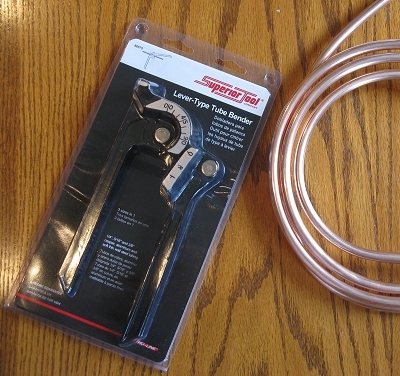 If you've picked up a lever-style tubing bender or borrowed one from a plumber friend, this method should work for you. 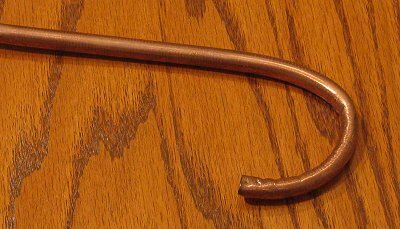 My copper tubing came curled up, so I straightened it out for a few inches before sticking it into the bender. Since you want the curve to come up almost to the end of the tube, stick the tube into the bender in the way I show in the photo to the right. 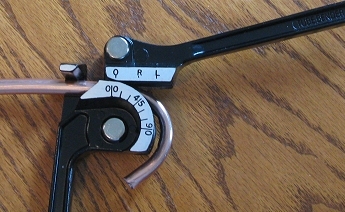 Make certain it is in the correct "track," then bring the lever around - you'll put a nice bend into the tube. I was a little disappointed that the inside of the curve buckled a little and the outside flattened out a little. Maybe I should dig up that spring thing and try using them both at once. Still, once they're painted and in position, you hardly notice, so it's not a "deal-breaker" like the results of using the spring by itself. Now slide the curved end through the bender another half inch or so, and bend again. You'll have to be careful that the bit that is already bent goes down into the track properly when you bend again. The photo to the right shows the results after I have done two bends and am getting ready for a third. The next photo shows the result after the third bend. When I over-bent my post, as I did in this photo, I was able to pull tip out by hand. In some cases, I still had a tiny bit more "straight part" at the curved end than I wanted, so I hacksawed off 1/4" - 3/8". I then measured so that the whole piece would be about 14" high and hacksawed off the other end. Then I tried to straighten out the "straight part" as well as I could, rolling it back and forth on the table like a child making clay snakes, but with more pressure. To get rid of the inner "burrs" that could slice up my wires, I stuck the end of my needlenosed pliers into the openings and twisted it back and forth like a ream. Of course, I couldn't help sticking one of my utility lamp fixtures into the thing to see how it looked. Pretty elegant, don't you think? Of course, at this point I had $65 into the project and one almost-ready-to go lamp. It ought to look good! Once I felt like I knew what I was doing, the rest of the copper lamp posts went pretty fast. Compared to bending the copper tubing, the pvc versions went very quickly. I slid a couple of the elbows together to see how long a piece I would need connecting them. It looked like there would be enough clearance for the whole shade of either lamp if they butted right up against each other. So I out a couple of 1"pieces and tried out the "look." Clunky, but very fast and very cheap. If I was doing this for permanent display, I'd have sanded out the "writing" on the outside of the elbows. But this was a "proof of concept," and if I got bogged down in details, I'd never have a finished project in time to publish this article. So I took the minor precaution of turning the lettering end "down" so it didn't show on the very top. A bigger problem was the "stickum" from the price labels I peeled off. Though I tried scrubbing it off with mild solvents, I had more success buffing them off with an old T-shirt. I figured I had too much linear PVC for four lamp-posts, but not enough for five, so I might as well cut four. I made certain I had four 1" pieces, and divided the rest into four pieces. I pressed the PVC lamp posts together (don't glue them yet), grabbed several of my favorite paint colors, and headed outside. Again, if this was a 100% "serious" project, I'd have wiped each lamp post with an appropriate solvent, made certain it was completely dry and fingerprint-free, then primed it, before adding the top coat. But this time I just sprayed on several different colors, including flat black, flat brown, nickel, and hunter green. Since I was short on time, I held them by the part that was going to go in the ground anyway and just sprayed the rest. I suppose I should have counted the cost of spray paint into the equation. However, I already had these colors on hand - in fact I keep flat black and satin Hunter Green on hand, as well as several other colors. . . . . The candy canes needed to dry in an upright position, of course. And I had recently trimmed my t\yarrow patch almost to the ground. So I figured they could sit on the "stumps" until they dried. I wasn't going to take a photo of this, but when I went back outside, it struck me as pretty funny-looking, so here it is. "Whatcha growin', there, Paul?" Now all that remains is to pull the wires through the lamp posts and fasten the lamp fixture to the post. 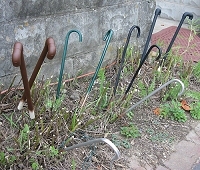 PVC Posts - When you try pulling the wire through the PVC posts, you'll figure out in a hurry why I left them unglued. They're a snap to feed through a piece at a time (like stringing beads). They're a pain to feed through the whole U shape at once. Copper Tube Posts - This is a little trickier. 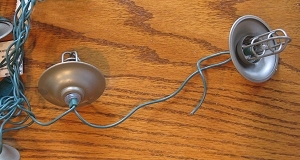 You may wind up feeding an unconnected wire through first, taping it to the end of the lamp's wires and pulling it through like an electrician feeding wires through a wall. Also, even if you've reamed out the bottom, the wire will jam up a little there, just fish it out and pull the rest through gently. You will need to replace the bulb eventually, so there's no point in making the final assembly too permanent. 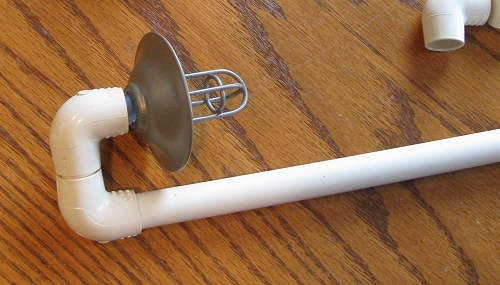 PVC Posts - The opening of the elbow is just larger than the soft, clear rubber grommet that holds the lamp fixture to the socket assembly. 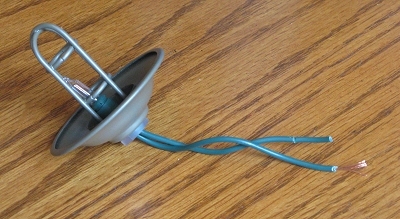 I put a bead of weather-resistant glue around the grommet and pulled on the wire to pull the thing firmly into place. Then I taped the end of the wire to the base of the post to keep the pressure on until it dried. Not much of the thing made contact, but it's holding in place. 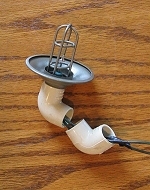 When it's time to change a bulb, I should be able to pop the thing out easily enough and glue the fixture back in. Copper Tube Posts - This is actually easier. The "back end" of the socket barely fits into the end of the copper tube. I pulled the light fixture off the socket altogether, forced the socket into place, where it seems that there's enough pressure to hold it. Then I slid the fixture back onto the socket. I haven't permanently installed these yet, though I did poke some of them into the ground and hook them up with a 12-volt power supply to get the photographs below. I tried to get a few different combinations and paint colors to give you some idea of the results. 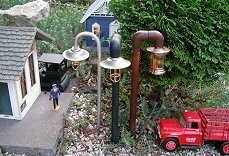 Before I install the lamp posts permanently, I will also coat the finished fixtures with uv-resistant indoor-outdoor acrylic spray, to protect them from rust and UV. That will make the "glass" on the lantern-style fixture look "frosted," but it will also slow down the yellowing process. I took the photo in the middle in late afternoon, just after the garden lighting system that illuminates my structures came on. I waited a little later to take the photo on the right, so you get an idea how the fixtures illuminate the scene. My overall conclusion is that the PVC version is way easier and way cheaper, but the copper tube version is more elegant. 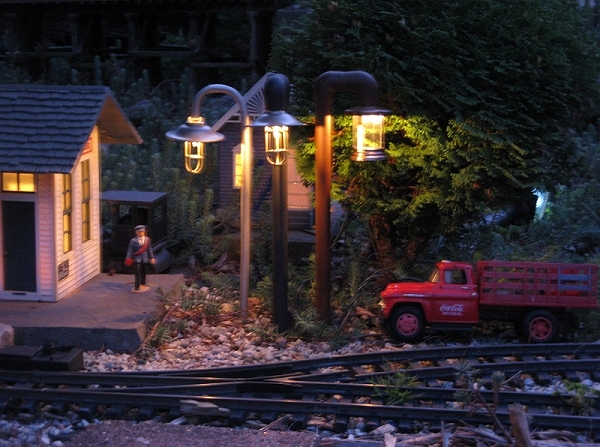 Also, I think that the utility-light fixture suits my early-to-mid-1900s railroad more than the lantern-style fixture. 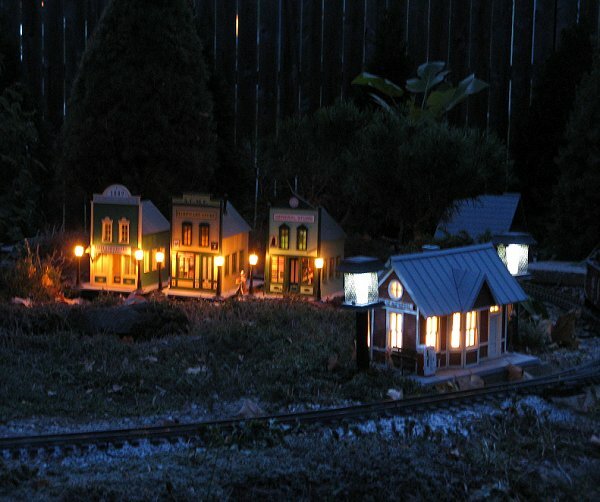 That said, the lantern style fixture could be very useful on an 1800s-era railroad, especially in larger scales like 1:20.3 or 1:13.5. I'm sure that folks who model in these scales can figure out ways to make the posts look more appropriate. Building up hollow "beams" from strip wood, so the wire can be hidden, might be one solution. Since I've already paid for the tube bender, I may just check to see if Wal-Mart is closing out the utility-light versions yet, pick up a few more packs, and "go to town." Other uses for these occur as well, such has having them stick out of building walls over warehouse doorways and the like. And other fixtures may come along next at Christmas season or next spring that will be useful for this sort of thing as well. Just about any specialty light strand that has ten incandescent bulbs (not LEDs) can be used this way. The only additional thing to consider is that it is very hard to find 12-volt replacement bulbs for these strands, so you'll want to be sure you keep any extras on hand. Finally, I've shown you my mistakes as well as my successes. When you try your own version of this project, please get in touch and let us know what works and what doesn't work for you. Above all, enjoy your trains, and any time you have with your family in the coming months. There is a trick for sharp bending of thin wall tubing without kinking. I learned the trick from a couple of old codgers that restored a very old antique car that included making a new radiator from scratch. They also owned a speeder and ran with the Speeder Club. The trick is to fill the tube to be bent with molten lead. Let it cool and bend it as if it was a solid piece of wire. After the tube is bent the way you want it you can then heat it up to melt the lead out.